This issue’s article (at the end of the newsletter) is an account by James Glover of the highly successful 2nd International Conference that took place in New Delhi from 27th to 29th December 2017. This event is on 17th and 18th March 2018. The website will be updated over the coming weeks as details are finalised. This book introduces trigonometry to children. This new edition is now available and has 4 additional chapters covering the solution of right-angled triangles without the use of a calculator. This excellent book on the Sutra "All from 9 and the Last From 10 "("Todos de 9 y el último de 10") is available to download. The conference was on 27-29th December 2107 and was a big success. Last academic year for me with 10th graders was wonderful. I am a life science post graduate and I always saw math as a very high and "not reachable", "only for clever students" subject. But Vedic math disproved my belief. It is so down to earth and reaches every last student. I learnt it with you so happily and I was able to teach it to 10th graders for exams last year. They scored 72% highest in board exam in math. We took only 3 months to complete and practice actual textbook syllabus. Rest of the time we did only VM and got familiarised with sutras. Children in our school are not from well to do families. They are all from slums of Bangalore and are the poorest of the poor. But they are all VM experts now. They teach it in their communities to other children also. I'm getting very good feedback from parents, teachers and especially students. Kids who hated Maths are finding it easy now. The Conference held in New Delhi was a huge success. We had nearly 200 delegates and about half of these were students attending workshops. Many spoke of the inspiration they felt on hearing the various research talks and participating in the workshops. It was also a wonderful meeting of like-minded people and enthusiastic teachers, keen on research and development of Vedic Mathematics and it's use in education, computer design, together with finding a greater understanding of Indian Mathematical culture. Delegates came from across India as well as overseas. The IAVM is hugely indebted to Dr Pankaj Mishra of the Department of Sanskrit, for his tireless work in putting together all the arrangements and logistics. We would also like to thank Kuldeep Singh and Sita Giri for their indenting background support. 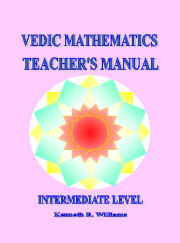 Research papers were themed as, New Applications of Vedic Maths sutras, Vedic Maths in Education, Ancient and Classical Indian Mathematics and Vedic Maths Techniques used in Computer Design. In addition to the presentations of new discoveries there were workshops for teachers and free workshops for school students. Even with such a broad scope and varied range of activities and talks the conference had a tremendous unifying effect on all those in attendance. Our sincere thanks go to Tata Trusts for sponsoring this event. We also thank Kuldeep Singh and Sita Giri for their invaluable support and assistance. The Institute for the Advancement of Vedic Mathematics is a UK based charity established to promote, disseminate, research and support the system of Vedic Mathematics internationally. The trustees and members are among the world’s leading authorities on Vedic Mathematics and have come together to offer services, host conferences and forums, and to take a lead on the integration of Vedic Mathematics into education through teacher training and the provision of resources. We commenced our journey in early 2016 and we were conferred the status of registered charity in the UK. Recently, our main focus has been in organising the 2nd International Vedic Mathematics Conference at St Stephen’s College, Delhi (27th – 29th December, 2017). However, as we look back from where we started, we see that we have achieved a great deal in a short span of two years. We continue to expand our programs and offerings to the community. Continue with our series of free monthly webinars. We hope that you will be able to volunteer to be a part in one or more of the above exciting initiatives and experience first-hand the pride we take in supporting the cause of Vedic Maths. If you are interested, please email us at or fill out the form enclosed in your brochure. As a not-for-profit charity we rely completely on donations and appeal to your generosity to help support our work and meet our objectives. We are hoping to raise a modest $5000 for the forthcoming year. This money will help maintain our website, run free webinars, organise and run online conferences, produce resources for teacher-training and improve our digital outreach. Would you consider making a tax-deductible donation to help us achieve our mission? Every donation makes a difference, and helps us move forward to reach our goals. You can donate online at http://www.instavm.org/donate.